The Redemption Of The Devil, a documentary about American rock band Eagles of Death Metal has been pulled from the International Documentary Film Festival in Amsterdam. The documentary follows band frontman Jesse Hughes in the build up to the release of their new album. Eagles of Death Metal were performing at the Bataclan concert hall where gunmen killed 89 people in last week’s Paris attacks. The band escaped, but members of their crew and record company were killed. The documentary, made by director Alex Hoffman, follows the band’s charismatic, hard-living frontman as he hits 40, becomes ordained as a Catholic minister and ponders a future in politics. 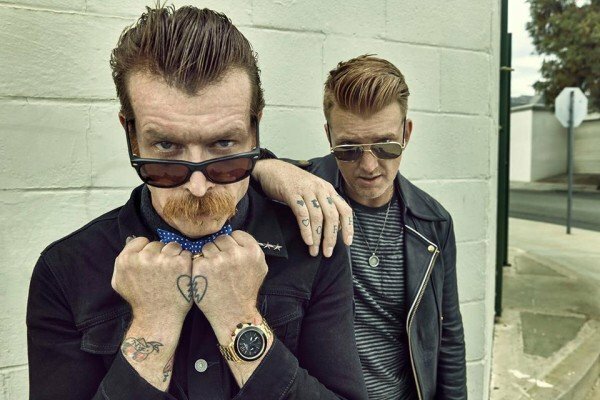 On November 19, Eagles of Death Metal issued their first statement about the attack and said they were “bonded in grief with the victims, the fans… and all those affected by terrorism”. They said they were “horrified and still trying to come to terms with what happened in France” and all shows were on hold until further notice. Meanwhile, new figures show ticket sales for concerts in Paris have fallen by around 80% since the series of attacks in the city. Following the incident at the Bataclan, bands including U2 and Foo Fighters cancelled gigs. The group is carrying out a full audit to see how many concerts have been cancelled, but fear the cost of extra security measures might lead to more shows being pulled. “Producers are extremely worried about the future. They work on quite a narrow margin,” the spokesman said, adding the Christmas period was crucial for the industry. French Culture Minister Fleur Pellerin has promised an emergency fund of 4 million euros to help get live entertainment up and running again and help with the cost of new security measures. However, Prodniss said double that was needed. “We have to rebuild the public’s confidence, make them feel happy and relaxed about going out to concerts again,” it said.